Event Description: A historic place to participate in a corporate teambuilding event, Geneva — straddling the Rhone River on the edge of Lac Leman (Lake Geneva) Geneva is an amazing European treasure hunt location with more history than you can shake a cuckoo clock at! Famous for banking, watchmaking, chocolate, and the world-famous Jet d’Eau, Europe’s tallest fountain, Geneva is the most international of cities, host to the European Headquarters of the United Nations, the World Trade Organization, and the World Health Organization. 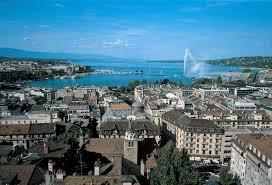 Much of Geneva’s Old Town (Vieille Ville) is closed to traffic, making it the perfect place for a walking treasure hunt. Old Town’s streets are narrow, with classic European architecture on every side. Art galleries, museums, shops, cafes and restaurants abound. During your corporate teambuilding treasure hunt…expect to visit Cathedrale Saint-Pierre, an architectural melange begun in 1159; discover the old arsenal near the Hotel de Ville (City Hall); stroll across the plaza of the ancient Temple de la Madeleine, dating from the fifth century; enjoy the green and shady Parc des Bastions, which contains the massive monument to the Reformation and the “new” city walls (dating from the 1500s); and find numerous historical statues, including one of Henri Dunant — the founder of the International Red Cross.